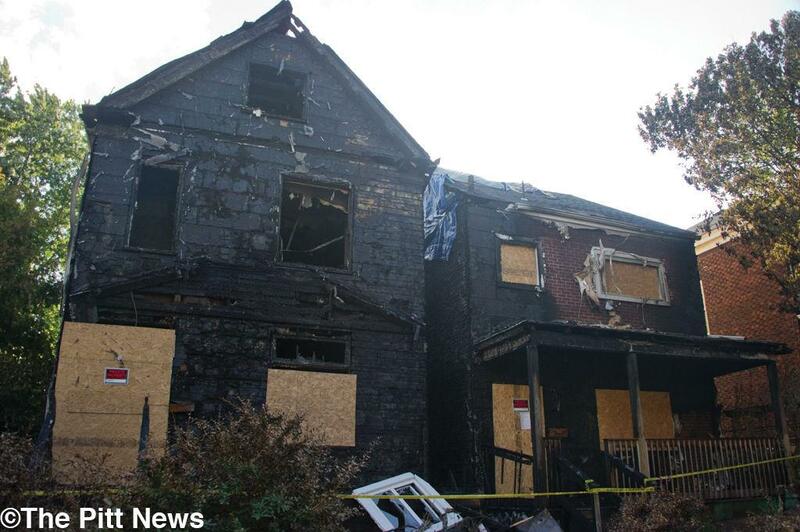 After a fire in the early morning hours on Friday left four Pitt students without homes, the University has intervened. At 2 a.m. on Friday, Sept. 19, Pitt police responded with city police and the Pittsburgh Fire Department to the 911 call from Orpwood Street. The fire, which destroyed 3702 and 3704 Orpwood Street, left all residents without injury, according to a Pittsburgh Public Safety release. Seven residents — four of whom are Pitt students — lived in the two homes. The residents of both houses lost all of their possessions, and two cats left in the houses died during the fire. The body of a third cat has not been found. Patrick Buehler and Rachael Greenwalt, both students in the Graduate School of Public Health who lived in one of the homes affected, stayed with Buehler’s family in the Carnegie area after the fire, according to Greenwalt’s close friend Chelsey Engel. Greenwalt and Buehler shared their house with Melanie DiBello and Belle Gee, none of whom could be reached for comment over the weekend. Next door, three people — two of them Pitt students — also lost their home and possessions. Cara Masset, director of University News, said the University could not release the names of any students involved. “The safety and well-being of students is a fundamental priority for the University, so any time situations such as this one arise, departments across the University will rally together to assist students,” Masset said in an email on Friday evening. All Pitt students affected by the fire will have the option to finish the fall semester in University housing for free and will then have the option to continue living there in the spring with normal rate charges, Masset said. Engel said Greenwalt and Buehler plan to stay with Buehler’s family while they look for other options. Last year, in March and November, several Pitt students lost their homes because of fires on Zulema and Dawson streets, respectively. Pitt students received aid from Panther Central and Housing Services after those incidents, according to earlier Pitt News reports and word from Pitt spokesman John Fedele. Last February, the undergraduate Student Government Board created the Undergraduate Crisis Relief Fund to support undergraduate, non-College of General Studies students in the case of an emergency. Though the Graduate and Professional Student Government does not offer a relief fund, it can help students apply for “emergency student loans,” according to its website. Engel, a Point Park graduate and longtime friend of Greenwalt’s, created a GoFundMe page three hours after the incident to raise money to ease her friend’s losses. “She called me at 3:30 [a.m.] and was in tears and said she needed a ride home from work because her house burned down,” Engel said. The cause of the fire is still unknown and under investigation, according to the Pittsburgh Public Safety release. “A smoke detector in one structure did operate properly after all occupants had gotten outside,” the release said. The Graduate School of Public Health and Pitt’s Student Affairs Office are collecting in-person donations for the students affected this week, Engel said. The GoFundMe page has raised $3,540 as of Sept. 21 for Greenwalt, DiBello, Gee and Buehler.